In zoology, shrew is the common name for small, mouse-like insectivorous mammals comprising the family Soricidae, characterized by a pointed snout, minute eyes, and small ears. 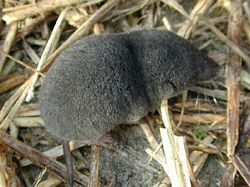 Although their external appearance is generally that of a long-nosed mouse, the shrews are not rodents and not closely related: The shrew family is part of the order Soricomorpha, which also includes the moles. Shrews have feet with five clawed toes, unlike rodents, which have four. Shrews are also not to be confused with either treeshrews or elephant shrews, which belong to different orders. Shrews include the smallest known mammals, and also ones with the highest heart rate and highest mass-specific energy consumption (Jurgens et al. 1996). Shrews also have sharp incisors and a reputation for having a savage disposition, killing larger animals and eating incessantly to stay alive. Some are known to be venomous, which is unusual among mammals, and unlike most mammals some species also can use echolocation. Shrews are distributed almost worldwide: Of the major temperate land masses, only New Guinea, Australia, and New Zealand do not have native shrews at all. In terms of species diversity, the shrew family is the fourth most successful of the mammal families, with over 300 species, being rivaled only by the muroid families Muridae and Cricetidae and the bat family Vespertilionidae. Shrews provide a valuable service for humans beings, as they consume pest insects and slugs that can damage crops. Beyond this, their small size, savage reputation, and unique behaviors have captured the interest and imaginations of people, adding to the wonder and mystery of nature. All shrews are small, most no more than mouse-size. The Etruscan shrew, Suncus etruscus, has an adult body mass between 1.6 grams and 2.4 grams for those caught in their natural habitat (Jurgens et al. 1996). As such, it is the smallest known extant mammal. Many shrews weigh only about 15 grams (0.5 ounces) and from 6 to 8 centimeters (two to three inches) long. One of the largest shrews is the Indian musk shrew, Suncus murinus, with body weights ranging from 33.2 grams to 147.3 grams (1.2 to 5.2 ounces) in males and somewhat smaller (23.5 to 80 grams) in females (Ruedi et al. 1996). Shrews also have a long, pointed and movable snout, small eyes, small ears, and a moderately long tail. They have generally poor vision, but have excellent senses of hearing and smell (Barnard 1984). Shrews have a very high metabolic rate. The Etruscan shrew was recorded to have a mean heart rate at rest of 835 (plus or minus 107) beats per minute with the highest heart rate recorded of 1,511 per minute (Jurgens et al. 1996). This is the highest heart rate ever recorded for an endotherm (Jurgens et al. 1996). The Etruscan shrew also has the highest mass-specific energy consumption of all mammals, with a resting shrew consuming a mean of 100mlO2per kilogram per minute (Jurgens et al. 1996). Shrews are found in Europe, Asia, Africa, and the North, Central, and South America. South America has shrews only in the far-northern tropics, including Colombia. Africa has the greatest species diversity. Shrews hold nearly 10 percent of their mass in their brain, a relatively high brain to body mass ratio (Kelly 2004). They are very active animals, with voracious appetites. Shrews must eat 80-90 percent of their own body weight in food daily. They are not able to hibernate. In general, shrews are terrestrial creatures that forage for seeds, insects, nuts, worms, and a variety of other foods in leaf litter and dense vegetation. As voracious predators, they will even attack and kill a larger mouse. Some specialize in climbing trees, living underground, in the subniveal layer, or even hunting in water (Barnard 1984). Shrews are fiercely territorial, driving off rivals, and only coming together to mate. Many species dig burrows for caching food and hiding from predators, although this is not universal (Barnard 1984). Female shrews can have up to ten litters a year, and the animals only stop breeding in the winter in temperate zones, and breed all year round in the tropics. Shrews have a gestation period of 17–32 days. The female often becomes pregnant within a day or so of giving birth, and lactates during her pregnancy, weaning one litter as the next is born (Barnard 1984). Shrews live for between 12 and 30 months (Macdonald 2006). The only terrestrial mammals known to echolocate are two genera (Sorex and Blarina) of shrews and the tenrecs of Madagascar. These include the vagrant shrew (Sorex vagrans), the common or Eurasian shrew (Sorex araneus), and the northern short-tailed shrew (Blarina brevicauda). The shrews emit series of ultrasonic squeaks. There are 376 known species of shrew in 26 genera. These are grouped into three extant (living) subfamilies: Crocidurinae (white-toothed shrews), Myosoricinae (African white-toothed shrews), and Soricinae (red-toothed shrews). In addition, the family contains the extinct subfamilies Limnoecinae, Crocidosoricinae, Allosoricinae, and Heterosoricinae (although Heterosoricinae is also commonly considered a separate family). The following are the 26 genera of living shrews. Barnard, C.J. 1984. Shrews. Pages 758-763 in D. W. Macdonald, The Encyclopedia of Mammals. New York: Facts on File. ISBN 0871968711. Buchler, E.R. 1973. The use of echolocation by the wandering shrew, Sorex vagrans Baird. Diss. Abstr. Int. B. Sci. Eng. 33(7): 3380-3381. Buchler, E.R. 1976. Experimental demonstration of echolocation by the wandering shrew (Sorex vagrans). Anim. Behav. 24(4): 858-873. Busnel, R.G. (ed.). 1963. Acoustic Behaviour of Animals. Amsterdam: Elsevier Publishing Company. Forsman, K.A., and M.G. Malmquist. 1988. Evidence for echolocation in the common shrew, Sorex araneus. J. Zool., Lond. 216 (4): 655-663. Gould, E. 1962. Evidence for echolocation in shrews. Ph.D. Thesis, Tulane University. Gould, E., N. Negus, and A. Novick. 1964. Evidence for echolocation in shrews. J. Exp. Zool. 156: 19-38. Hutterer, Rainer. 2005. In Wilson, D.E., and D.M. Reeder (eds. ), Mammal Species of the World, 3rd edition, Johns Hopkins University Press. ISBN 0801882214. Hutterer, R., and P. Vogel. 1977. Abwehrlaute afrikanischer Spitzmäuse der Gattung Crocidura Wagler, 1832 und ihre systematische Bedeutung. Bonn. Zool. Beitr. 28(3/4): 218-227. Hutterer, R., P. Vogel, H. Frey, and M. Genoud. 1979. Vocalization of the shrews Suncus etruscus and Crocidura russula during normothermia and torpor. Acta Theriol. 24(21): 267-271. Irwin, D.V., and R.M. Baxter. 1980. Evidence against the use of echolocation by Crocidura f. flavescens (Soricidae). Säugetierk. Mitt. 28(4): 323. Jurgens, K.D., R. Fons, T. Peters, and S. Sender. 1996. Heart and respiratory rates and their significance for convective oxygen transport rates in the smallest mammal, the Etruscan shrew, Suncus etruscus. Journal of Experimental Biology 199: 2579-2584. Retrieved April 19, 2008. Kahmann, H., and K. Ostermann. 1951. Wahrnehmen und Hervorbringen hoher Töne bei kleinen Säugetieren. Experientia 7(7): 268-269. Kelly, K. 2004. Brains of white matter. The Technium. Retrieved April 19, 2008. Köhler, D., and D. Wallschläger. 1987. Über die Lautäußerungen der Wasserspitzmaus, Neomys fodiens (Insectivora: Soricidae). Zool. Jb. Physiol. 91: 89-99. Macdonald, D.W. 2006. The Encyclopedia of Mammals. Oxford: Oxford University Press. ISBN 0199206082. Ruedi, M., C. Courvoisier, P. Vogel, and F.M. Catzeflis. 1996. Genetic differentiation and zoogeography of the Asian house shrew Suncus murinus (Mammalia: Soricidae). Biological Journal of the Linnean Society 57: 307-316. Sales, G., and D. Pye. 1974. Ultrasonic Communication by Animals. London: Chapman and Hall. ISBN 0470749857. Tomasi, T.E. 1979. Echolocation by the short-tailed shrew Blarina brevicauda. J. Mammalogy 60(4): 751-759. This page was last modified on 15 September 2015, at 16:56.